Zray is one of the companies that decided to go big because going home wasn’t an option. With a wide range of inflatable products, Zray was able to establish a solid costumers’ platform for themselves being authentic and dedicated. One of their highly praised iSUPs is here with us today for anyone who’s a racing or speed touring enthusiast; the R2 is a really nice board with a great character to it. And like usual, in this review, we’re going to bring this board a little closer for you to help you see and know all you need about it. 14' x 28" x 6"
The R2 is built to conquer the water; it’s 14 feet long which is undisputedly the best a racing iSUP can ever get. This inflatable paddle board is huge in real life, it literally makes you stop and stare for a while; it’s almost 3 times the size of a fully grown adult. Nevertheless, it’s not that hard to maintain it when it comes to inflating/deflating or packing. In terms of width, the R2 is a solid 28 inches. Usually, stand up paddle boards are 30 inches wide, but when it comes to racing, boards need to be slimmer to deliver their sharpest cut through the water and to quickly pick up speed. However, the R2 remains a very stable iSUP which is great for touring as well. Finally, this board is 6 inches thick which technically means the board will remain afloat no matter what the weather brings and regardless of the water condition you’re in. To know what I’ll be talking about, it would only take a moment of your time to try and grab the R2 and have a closer look at it. This board is meant to be indestructible, and to make sure that’s what you get, Zray built the R2 using double layers of heavy duty military-grade PVC on the R2’s outer shell and that’s something to be excited about; this board is going to be very hard to damage. Now to put the board’s parts together and guarantee you an iSUP that’ll maintain its shape under high air pressure, Zray used the famous drop stitch technology and rugged PVC material that’ll make the R2 a super rigid and stiff racing paddle board. Once fully inflated, this board is a piece of art; no flex, no bulge. The Zray R2 is what you can call a fully equipped iSUP, it comes with everything that makes stand up paddle boards special as they are. On the first sight, you’ll notice the beautiful gray and sharp traction pad with bright yellow stripes on it. It’s thick and soft to enhance your feet’s comfort, and it’s also very grippy to always have your back against slipping off the wet board. The best thing about this pad is how it’s almost covering all of the board’s back; you’re safe and supported anywhere you stand. Next, there is a bungee system that consists of 8 D-rings which is a lot of room for any kind of storage. This feature comes super handy for riders who enjoy long distance touring trips. There are another 6 D-rings distributed on the board’s sides that’d work for anything like attaching a cooler or a kayak seat. One last D-ring is at the end of the board to attach a safety leash for better security. Now to make the R2’s performance even better, a central removable fin is featured here as to make sure the tracking is on point no matter who’s riding it. This feature right here proves handy especially in flat water where it’ll help you use minimum effort to keep the board straightly moving. Also, there is a central carry handle that’ll make it possible for you to carry this big guy with one single hand. Still, there are two extra handles for when you need help transporting it. To be honest, one of the best things about Zray’s inflatable stand up paddle boards’ packages is their amazing backpacks in which you can fit the whole thing. The R2 comes with one of these quality bags that also look good to match the iSUP. Along with the backpack, there is a high pressure pump that does the job perfectly; yet, it’ll require time and effort to inflate such a big iSUP using only a hand pump. Thus, it’s highly advised to use an electric pump if available. 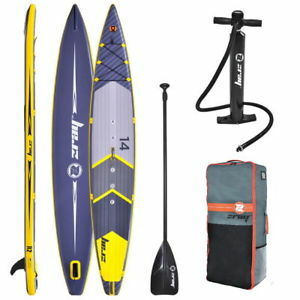 There is also a 3-piece aluminum paddle that can easily be adjusted to fit any rider’s height, and a closing belt to keep the deflated board folded in place. 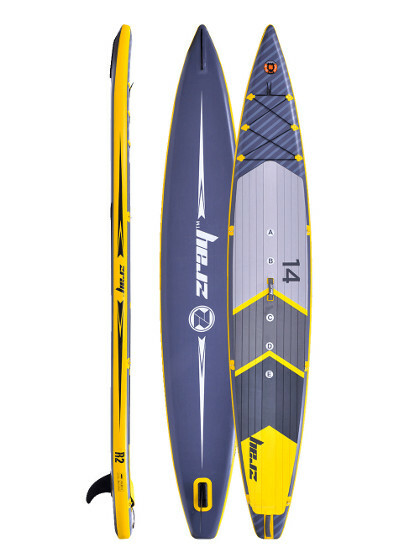 The Zray R2 is one hell of a stable board; it is the perfect size and dimension for an iSUP to do just great in different water conditions and activities. Taking the R2 on tour in the nearest lake was a pleasure; this board is smooth and strong in a way that makes stand up paddle boarding more than just a friendly water sport. The R2 tracks very nicely and it’s impressively responsive thanks to its sharp nose and slim body. These last two factors reduce water resistance to the minimum and that makes paddling almost effortless. Now using the Zray R2 to satisfy my need for speed, I wasn’t disappointed at all. The more power you put into paddling, the faster you get. The thing though is that it doesn’t take as much effort to feel the speed as it would on a regular, all-around paddle board. That being said, the R2 makes a great touring/racing iSUP; you can go on a long touring trip with everything you need right on board next to you, except that it’ll be faster and cooler. All in all, this racing iSUP makes a great fitness companion that’s guaranteed to change what you knew about stand up paddle boarding. The Zrya R2 is one of the best racing/touring iSUP. It’s 14 feet long which is the best for racing. It’s very stable and responsive. It comes with one of the largest EVA traction pads ever. It’s very roomy with a great storage area. This board is really large, thus, inflating it every time will get daunting. Using an electric pump is highly recommended in situations like these.